In this session, Klein converses about the reason firms exists, what are their boundaries, the limits of the organization and why does entrepreneurs are key elements in markets where uncertainty and risk are always present, to contribute with the well-being in life of a society. 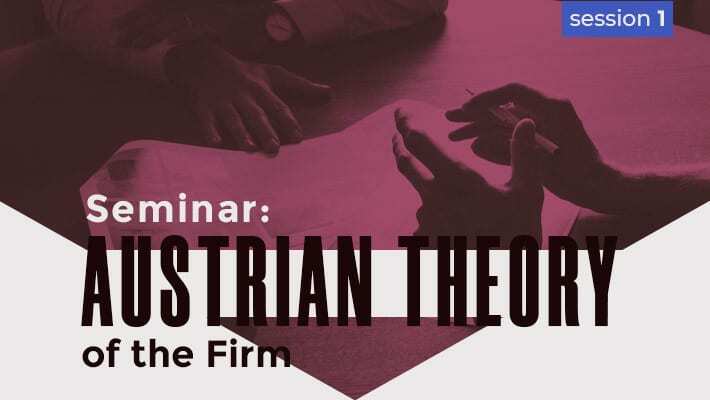 While Marxism argues that the essence of a firm is the power a person acquires to bosses all over the workers, Klein analyzes the different motivations of opening a firm by studying the human action. He states that even in Marxism, some organizations have to deal with economic calculation, the allocation of scarce resources and the lack of perfect knowledge. During the seminar, Klein and the participants analyze the firms in a sociologist perspective. They discuss Mises’ concept of praxeology and the relationship with the entrepreneur and economic calculation. Also, they talked about the differences in profit and non-profit organizations. Non-market organizations cannot use economic calculation the way that market-based, profit-oriented organizations can, but that doesn’t mean they’re illegitimate, it just means they have to use different methods for achieving their goals”. Lastly, they discuss the entrepreneurial action of judgmental decision-making, which is the ultimate decision authority of how resources (market assets) will be used.